This amazing shot by LAT's Karen Tapia-Anderson may be the most memorable photo taken by scores of photographers covering the California wildfires. 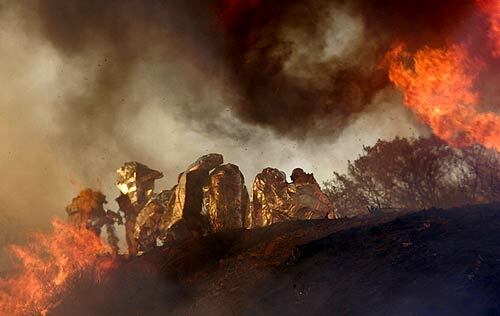 LAT's Janet Wilson follows up on these volunteer fire fighters caught between flames in Modjeska Canyon. With no place to escape and the fire about to overtake them, someone gave the order "Deploy your emergency packs" -- metallic, fireproof coverings called "shake 'n' bakes" by the firefighters. The eerie sight of the huddled firefighters was captured in a photo that appeared in Tuesday's edition of The Times. It was the first time the emergency packs had been deployed by firefighters in Orange County. How Anderson got the photo would also be a good story worth reading. A good time to remind you that this Friday, LAPD, LAFD, FBI, CHP and the Sheriff’s Department will be honored at the 8th Annual Appreciation BBQ from 11am to 2pm at the Ernst & Young Plaza (at 7th and Fig). It costs $5 and will benefit the Los Angeles Police Department Memorial Foundation.